Keep Your Floors Clean by Keeping Kitty Litter from Tracking All Over the House with The Innovative Trap Litter Mat™! When you’ve got cats, you know first-hand how annoying it can be when they track litter out onto the floor after they’re done using the bathroom. And while you love your precious kitties, cleaning up their scattered litter can be a real pain. That’s why we created the Trap Litter Mat™ that sits in front of their litter box and captures all the tiny granules before they have a chance to bounce across the floor or get stuck to your socks or bare feet. 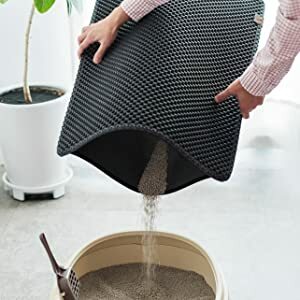 Larger Universal Cat Litter Catcher – Each size mat supports all types of cat litter, including clay, crystal, corn, clumping, wheat, and pellets! Easily fold the 2 layers and dispose the locked litter back in the litter box! Save Money & Time! Non-Slip Backing: This mat stays where you put it! Catches litter continuously and won’t constantly shift around when your cat climbs in and out of the box all day long. Enjoy a "Stench-Free" Home: Our BPA-free, Odor Resistant Mat is Urine Proof so liquids don't soak through. Simply shake of or vacuum up excess litter to clean it. No more stinky trapped litter! Universal Cat Litter Catcher – Each size mat supports all types of cat litter, including clay, crystal, corn, clumping, wheat, and pellets! Item corresponding to the description. Fast shipping and delivery, I recommend this seller! Good. I don't know how to serve. Big. That's so cool! No more littler on the floor. Look at the difference! Good quality product, requirements… Came in a simple packaging, but arrived undamaged or wrinkled. Very good mat, very large, long waited. Performs its functions. I recommend.